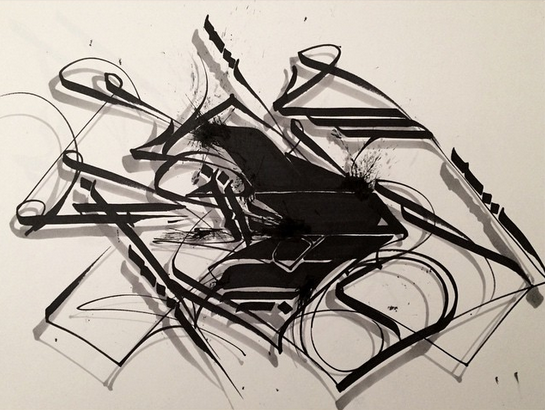 His favorite letter may be T, but street artist Tubs rules the entire alphabet. How do we know? 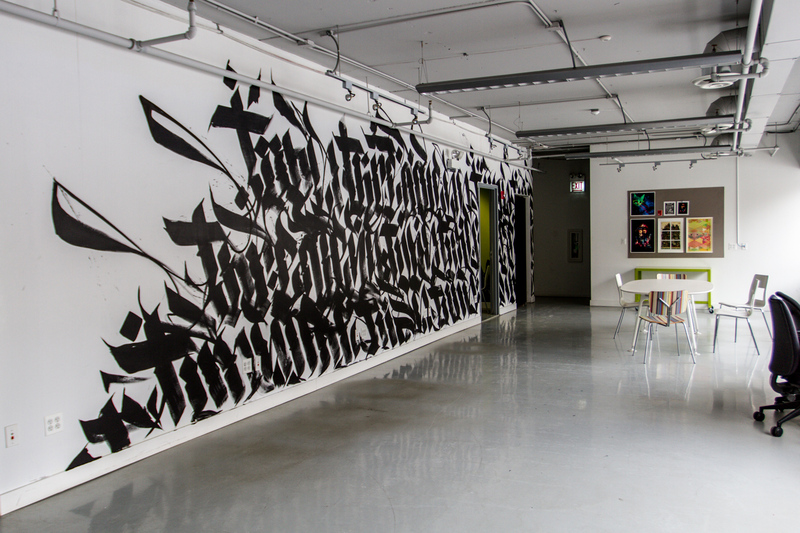 The calligraffiti artist stopped by Threadless HQ, created a mural, and wowed us with this awesome design. 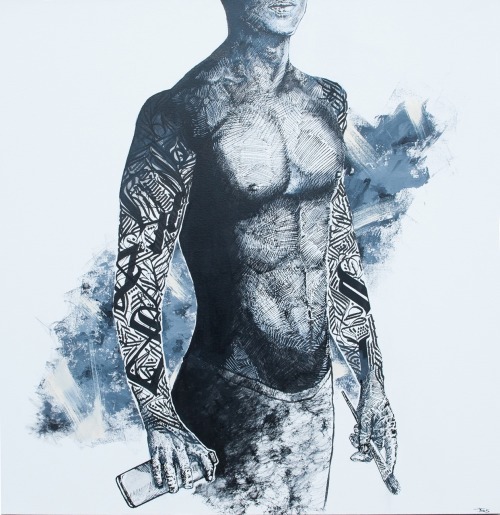 The Chicago native, who initially learned art from his parents, spent years refining his technique to develop a style that is distinctly his. You might say he has a way with words… that’s sure to leave you speechless. Read on to learn more about Tubs, his work, and the awesome piece he created for Threadless! Hey, Tubs! 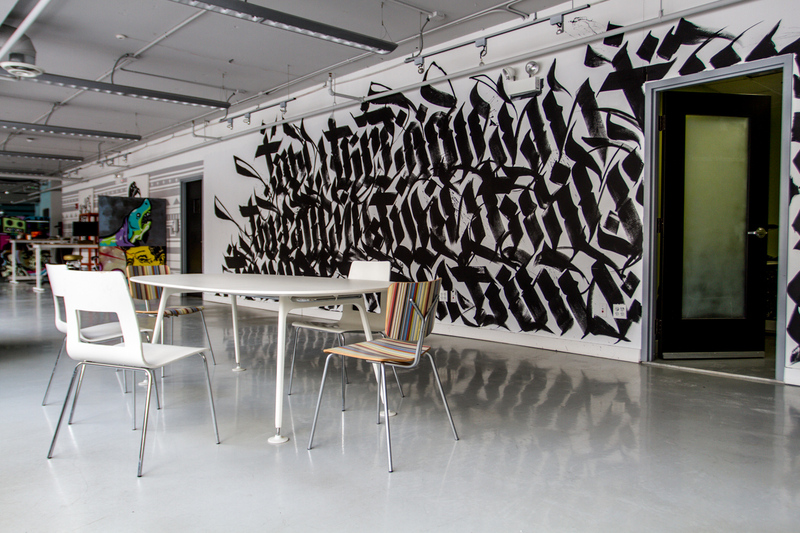 We’re super thrilled about the mural you recently created at Threadless. Why don’t you tell us a little bit about yourself? 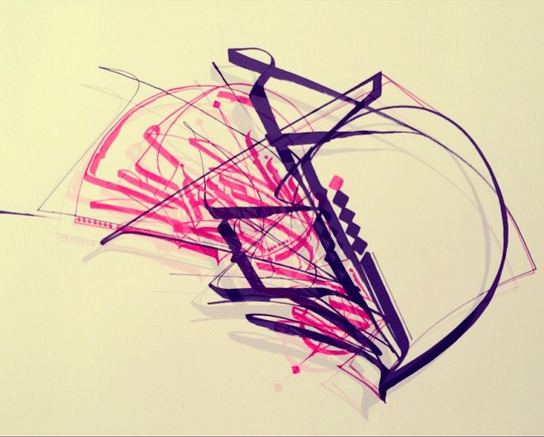 I’m a young Latino artist from the south side of Chicago who started out as a graffiti writer. I fell head over heels for the art, and it snowballed after that. More traditional forms of art also interested me. My parents are both artists, and my father introduced me to many different classic art forms and artists. My mother introduced me to calligraphy at a young age. What is your first memory of being introduced to art? Probably being about four or five years old watching my father paint in his studio. I always had a love for letters and letter forms. 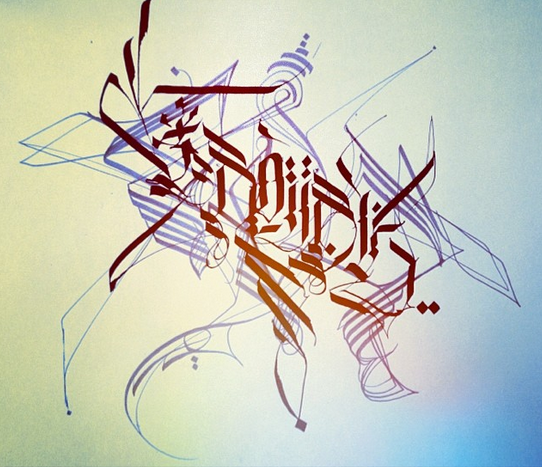 When I saw other artists taking the traditional calligraphy art form to the streets, it inspired me to push my letter style and create something new with in my own style. In what ways has art grown to become such an influential part of your life? Art has always been part of my everyday life, so I’ve continued doing what I’ve always done. Now I simply expressing myself through art on a bigger platform. Literally everywhere, from graffiti on the L trains, to old school gang graffiti, to old typography books. What’s your general process of creating a mural? You have to have a vision first, and an idea of what you’re trying to express with the mural. What message or feeling do you want it convey when someone sees it or simply walks by it? 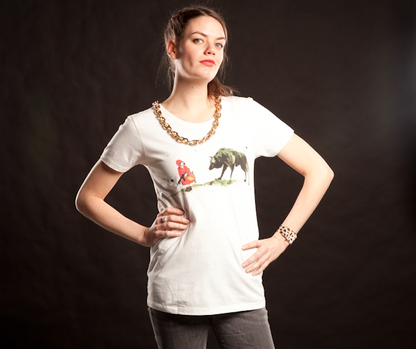 How did you become involved with Threadless? I know a few other really cool artists such as JC Rivera and Nstj who have worked with Threadless, and I believe it was my homie JC Rivera who connected me with someone there. The rest is history. When you saw the big, bare white wall, what thoughts did you initially have for what you wanted to create? I wanted to create something that expressed the creative environment of Threadless, from their designs to their events, as fast and cutting edge, to anyone who walked past it inside or saw it from the outside. How did you land on the ultimate design? I had sketched up something previous to hearing from Threadless that I really wanted to expand on, but I left it sitting there. Then I got the call from Threadless, and the tour of their office really inspired me. I went home and added the final touches to the sketch and it worked out really well. 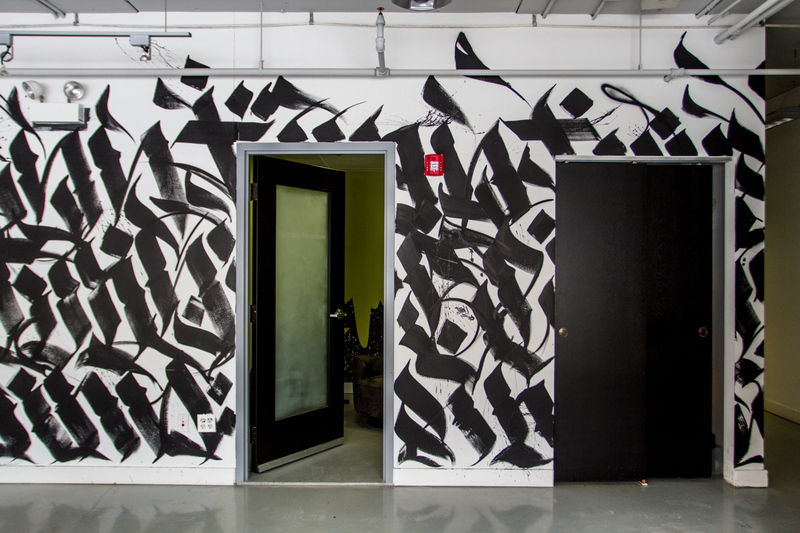 I feel I bring a blend of so many things that personally inspire me, like traditional calligraphy, modern calligraffiti, Arabic calligraphy, cholo lettering, and graffiti handstyles that I love. The letter forms are an expression of myself. 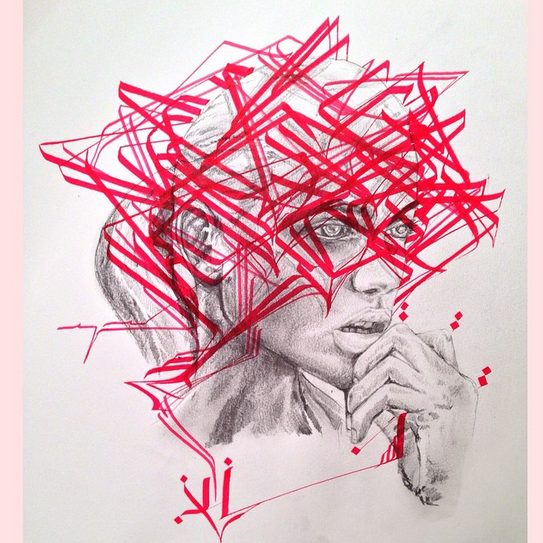 In what ways do a sense of geometrics and patterns play into your work? Sometimes they play a huge role, especially when it comes to the balance and flow of a design, because that has to be right. If it’s not, it simply won’t work. 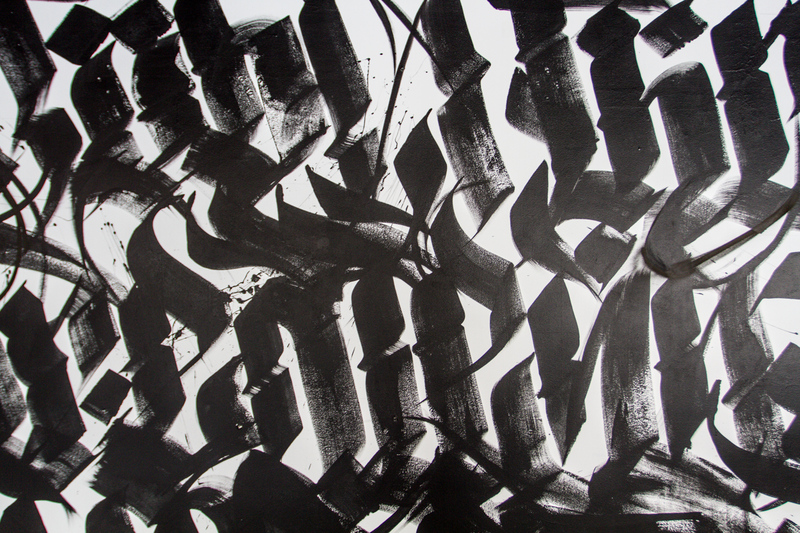 I also love adding geometric shapes and designs to my abstract calligraphy to give another dimension to the overall flow of the piece. Do you have a favorite letter to create? 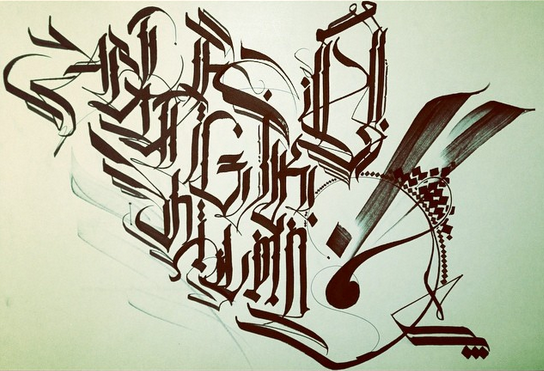 I like R, B, A, and S, but my favorite is probably T.
What advice do you have for those trying to get into calligraphy? Practice. You have to understand the basics before you can start breaking the rules. Do you have any shows or events coming up that we can check out? I hopefully have a show coming up in April at the Elephant Room with two other artists, Sam Kirk and Sentrok, that I originally showed during Art Basel at Scope Gallery through the Red Bull Canvas Cooler Project. What’s your most favorite piece you’ve ever created and why? To date, I would say the Threadless mural. The flow and overall feel of this mural was insane, and I had so much fun doing it. Hopefully it won’t be the last. Well, we gotta say. We think it’s pretty rad too, Tubs! Content Manager & Writer at Threadless. Into the usual stuff like words and music and internet animals. 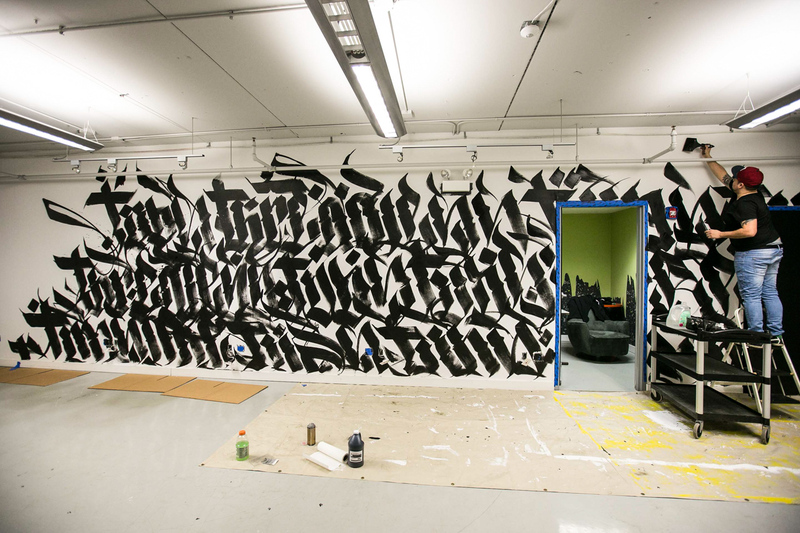 Posted in Behind The Tees and tagged alamillo art & design, calligraffiti, calligraphy, office art, street art, threadless, tubs, tubsz, tubsz_illa. Bookmark the permalink. Winter: Love It Or Hate It?